Considering the lucrative box office of the two predecessors it's not a surprise for anyone at this point that the third and final installment of the Taken trilogy also enters US cinemas (and most likely other territories, as well) with the mass-appealing PG-13 rating. For the two other films, that meant severe censorship usage before the Blu-ray would include an uncensored Unrated Cut later on and thus give fans Bryan Mill's endeavors with considerably more punch to them. It's mere speculation at this point whether Taken 3 will get that sort of happy ending but it is a fact that censorship definitely plays a role for its theatrical release in the UK. The British ratings board BBFC lists an entry in its database that informs that the desired 12A rating was reached by applying adjustments. The situation is complicated, so bare with us. Since they talk about the film being submitted in an "incomplete form", a scenario could play out that is similar to the most recent unfortunate cases of Hercules (see news) and Pompeii (see news). Those were censored during post-production upon advice from the BBFC and were then presumably integrated in the film's releases worldwide, also on DVD and Blu-ray. But that still is no regularity as counterexamples such as Alexandre Aja's Horns (see news) show. But even the prior 2 films make the situation more complicated in this case. While Taken was fully uncensored in French or German cinemas, it was heavily censored in the US for the PG-13 (see comparison) and also less censored in the UK for the BBFC 15 rating. Especially notable was the electrocution scene that used entirely different material, thus suggesting that this was planned prior to submitting it for the rating process. Taken 2 was seen by the BBFC for advice and given suggestions on how the desired 12A rating could be achieved by applying censorship. It was also known that the PG-13 version in the US was censored. Unfortunately, the British theatrical version was not released on DVD/BD later on and we couldn't check whether the BBFC suggestions stayed exclusive in the version shown in UK cinemas or whether they were used in the editing process of the US PG-13 version (thus being taken over for theatrical versions worldwide). Later on, the obligatory Unrated Cut reversed whatever was censored (see comparison). However, the same dilemma presents itself to us now with Taken 3, as well. We now know that the film was pre-cut for the UK theatrical release and that this had worldwide implications in two very recent cases (see above). Furthermore, one could assume that the PG-13 version was censored, as well, since trailers and featurettes include scenes that seem quite suspicious (e.g. the shotgun scenes). Fans will once again have to hope that an Unrated Cut stands at the end of it all. In the case of the Taken trilogy, history calls for optimism. 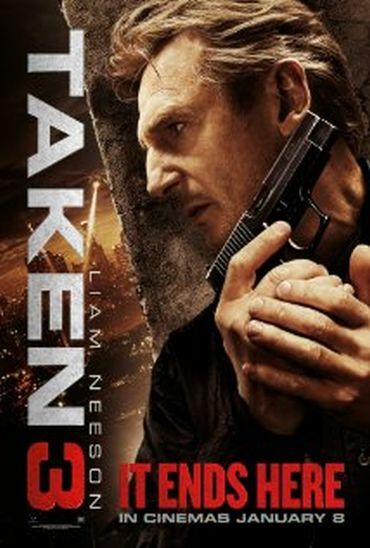 Taken 3 starts in UK cinemas on January 8th, 2015, while the US have to wait a day longer.